But nothing should be impossible. Our multi-talented Program Engineers, part of the Global Engineered Solutions Team, specialize in projects similar to the one mentioned above. Structured to meet your needs, Program Engineers operate with a “inception to completion” mentality. From the moment your request is processed, to the day you produce your very first quality part, we’ll have someone by your side. Ranging from a package of simple “between sizes” drills, to a 250 insert modular milling cutter, our team will design cutting tools centered to your specific application. We’ll have your tools assembled, preset, balanced, and delivered right to your doorstep, for out-of-the-box (and ready to run) convenience. We understand that something like assembling and presetting tools isn’t your favorite part of the job, so we’re just going to do that for you. If you work with an integrator, or perhaps through a supplier, we welcome third-parties throughout the entire process for a seamless transition to your facility. And one last thing: If you’re planning to purchase a brand-new machine for an upcoming project, we specialize in working alongside machine tool builders to offer you a turnkey package. If you’re thinking, hands-free and stress-free project execution? That’s right. Anything is possible. 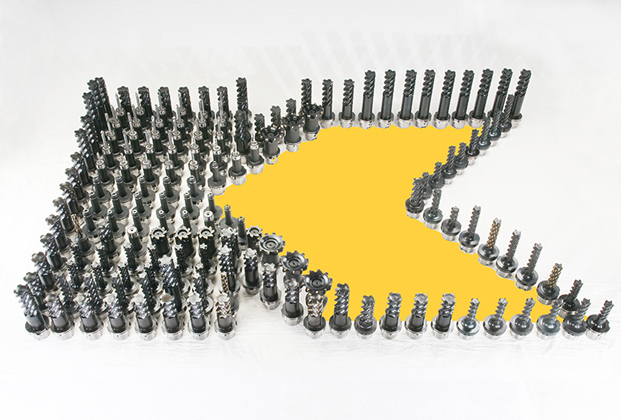 Leveraging all of Kennametal’s expertise and the latest innovations, our Program Engineers are ready to tackle your toughest application. If you find yourself in this situation and would like us to supply a quote or would just like more information, contact your local sales engineer or our service center at (800) 446-7738. Stay tuned for our next article, where we’ll explore the “logistics” behind our operation.